The efficiency of a development team significantly depends on the implementation of the right coördination system. Agile methodology is one such approach in project management that focuses on collaboration, constant improvement, flexibility, and top-quality outcomes. It helps software engineers create excellent software. However, can companies implement an Agile approach in managing offshore teams? Several tech companies hire foreign teams to perform many of their software development projects in a bid to optimize these activities while saving of costs and time. But unlike traditional teams, managing offshore developers is hindered by problems such as communication, differences in culture, time zones and locations, team discipline, task management, and control. Here is how to implement Agile methodology to get the most out of offshore developers irrespective of their country or physical location. When working with a team that is distributed in different locations, it is best to define the volume of the task at hand and when it should be completed. With that, you can create an in-depth work strategy for the team. Also known as Scope of Work, this strategy should contain the reports, milestones, and timelines for deliverables expected from the team. You can divide the project further to specific tasks to make the software development more flexible. Once you have a list of all the tasks involved in the project development, divide the process by timelines – with short iterations/sprints – to create the product roadmap. It should show what is required to achieve the project’s vision. It should be flexible, however, to adjust to the speed of the developers and external factors. Have the team demonstrate intermediate results on completion of each iteration. This way, you can learn what the team achieved at each milestone and whether their performance meets your expectations. Also, this technique helps you figure out bugs and challenges from your project’s beta stages. 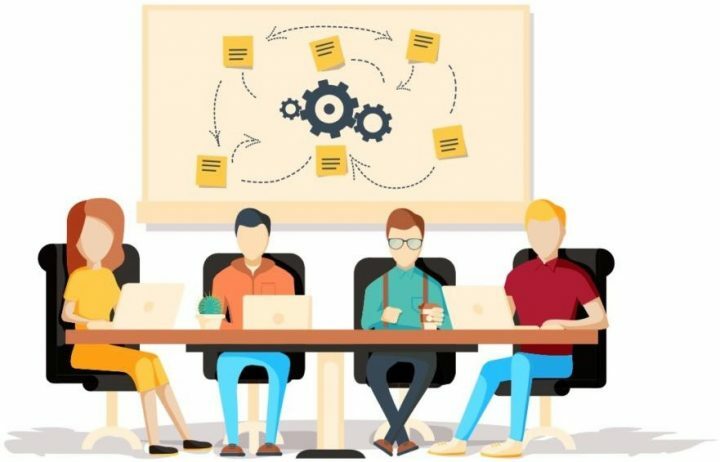 Collaboration technologies like Slack, Trello, Asana, Quaive, and JIRA will help make the cooperation with the remote team more effective and transparent. They easily simplify team-based work management by allowing team members to organize and plan workflows, projects, tasks, etc. in order to keep the team’s work on schedule always. Quick but simple regular meetings with the team members are good for sharing goals for each day and addressing any new challenges. Having planned summit regularly with the team members will significantly improve teamwork, create a better working atmosphere, and greatly increase production output. Short regular status-check meetings for the whole team. Transparent interactions among all members. Communication and documentation of all the decisions concerning the project. Consistent times for video and calls meetings. Availability of all team members for prompt resolution of issues. Use of single vocabulary for smooth and clear communication. Instant messaging and group chats like Slack. Project planning tools like JIRA. Build motivation and trust in the team. Each member should feel that they contributed to the overall success of the project. Provide the right tools for the team. Distributed Agile teams depend on tools and process to do the best work. Have clear guidelines for efficient work. Make sure that the team has the best standards and practices to follow. Distributed teams, if managed using the right approach can be more productive than even traditional teams. Use Agile best practices to achieve trust and high performance. Previous ItemLinkCollider Review: a Viable Tool for SEO/Social Boost in 2019?